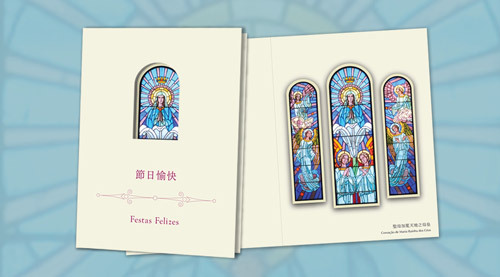 Macao Post and Telecommunications Bureau will issue a Christmas card with the image of stained glass windows “The Coronation of the Virgin Mary in Heaven”, of the Cathedral of the Nativity of Our Lady. This card will be available for sale at the General Post Office, all post offices and postal kiosks on 3rd December, 2018. This greeting card priced at MOP15.00 each, can be sent to any corner of the world without stamp. It’s saving your time and money.